Les Cascades du Herisson (The Hérisson Waterfalls or Waterfalls of the Hérisson; also Les Cascades de Hérisson with one less definite article) was perhaps the one waterfall excursion in France that made us see waterfalls in our sleep! 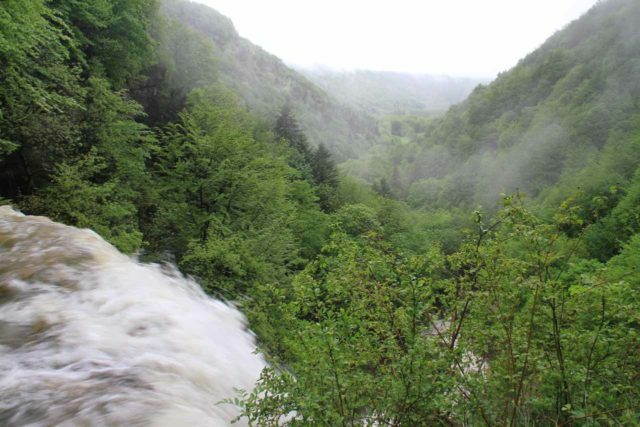 That was because the Herisson Valley harbored at least seven significant waterfalls on the Herisson River (at least three of them were major high-volume waterfalls of over 35m) plus we noticed a few side cascades and waterfalls draining into the river itself. The Herisson River was sourced by Lake Bonlieu and the Ilay Lakes so the waterfalls were said to flow year-round. 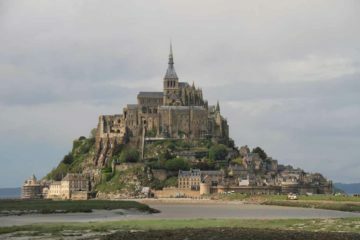 Apparently, this site was considered a heritage site in France due to its history of human habitation as well as its scenic allure. 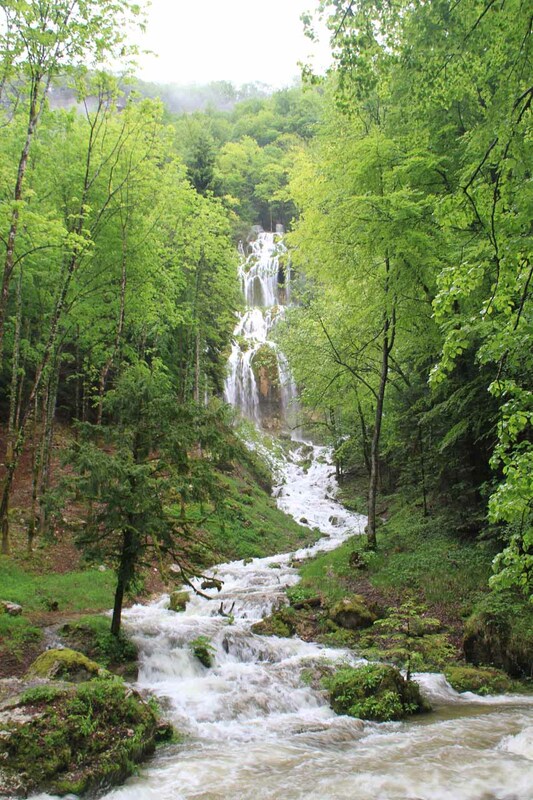 This waterfall series was the main scenic attraction in the Jura department of the Franche-Comté region – an area that was also known as le pays qui respire or the country that breathes (suggesting you can relax and have room to breathe here). Indeed, after partaking in our own self-guided hike while breathing in the cool and misty mountain air, it definitely felt like we were in a very different part of the country. There were a lot of ways to visit the majority of the Herisson Waterfalls thanks to there being connecting trails and several alternate entry and exit points with car parks. All but one of these car parks were above the Herisson Valley. 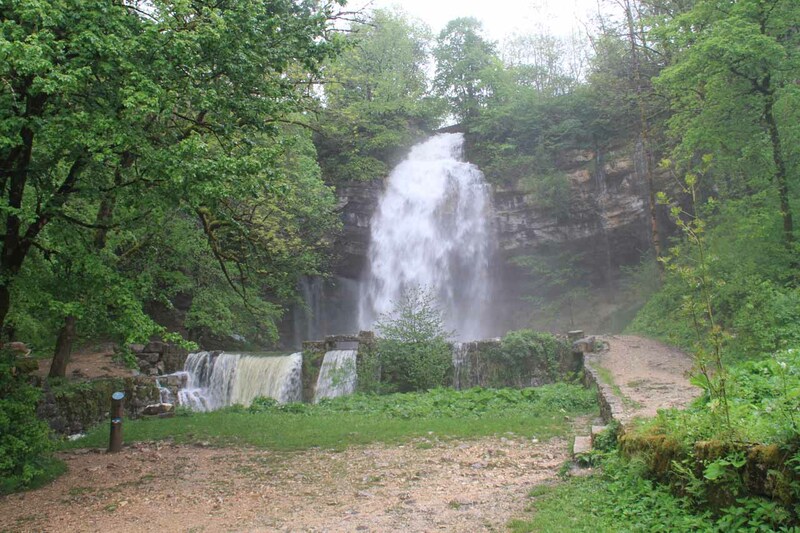 However, we thought the most strategic way to experience the waterfalls was to drive into Herisson Valley and stop at the large car park that was closest to the camping area as well as La Maison des Cascades (“The House of the Waterfalls”) Visitor Center (see directions below). 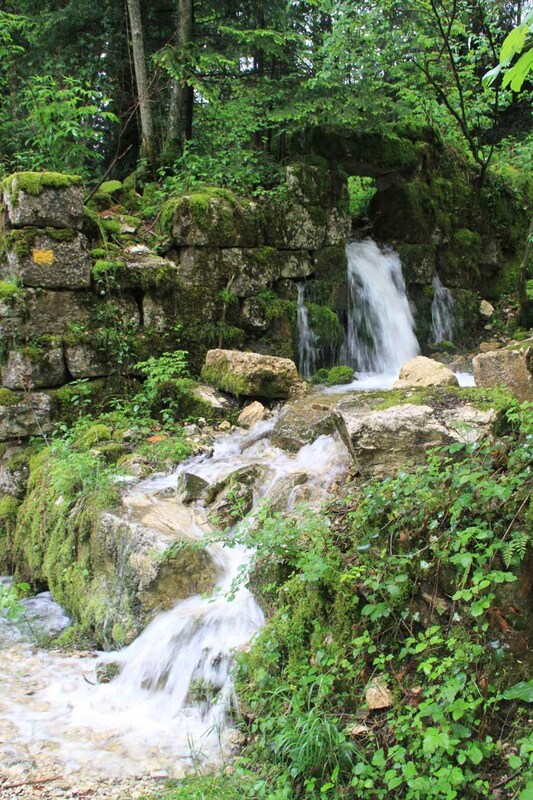 By starting from this spot, we were able to take our time as we gradually walked uphill while enjoying each of the major waterfalls en route on the ascent. 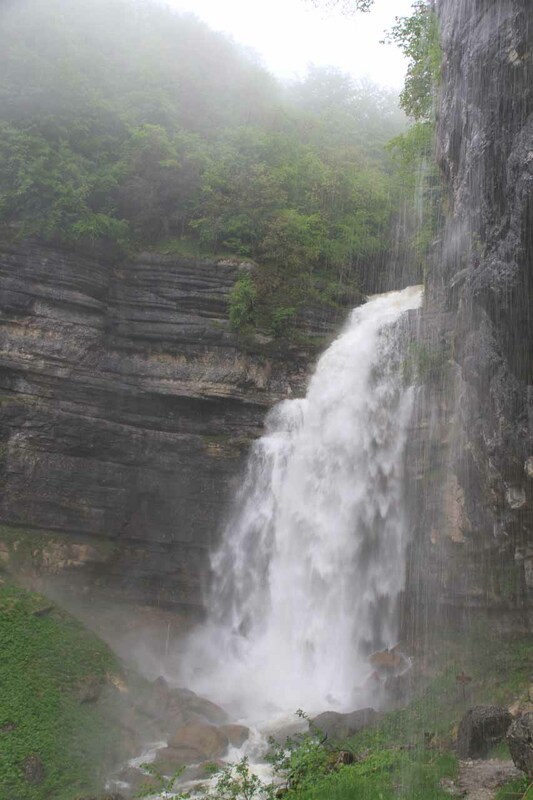 The two largest Herisson Waterfalls – L’Eventail and Le Grand Saut – were also closer to the bottom of the valley so these were amongst the first waterfalls that we saw. When we went as far up the valley as we were willing to go, it was all downhill on the return to the car park as we enjoyed the waterfalls once again. 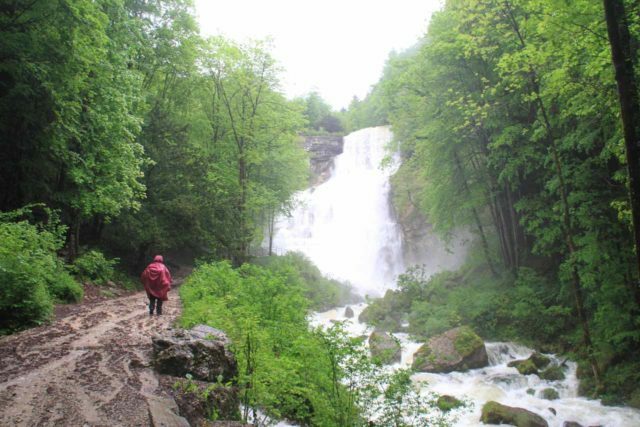 The walk to take in all the waterfalls starting from La Maison des Cascades was said to be an out-and-back hike of 3.7km each way (or 7.4km round trip which was about three hours total). The elevation gain for the entire hike was said to be about 250m. We were glad we came prepared with a decent pair of hiking boots because there were plenty of spots where the trail was wet and slippery as well as rocky. 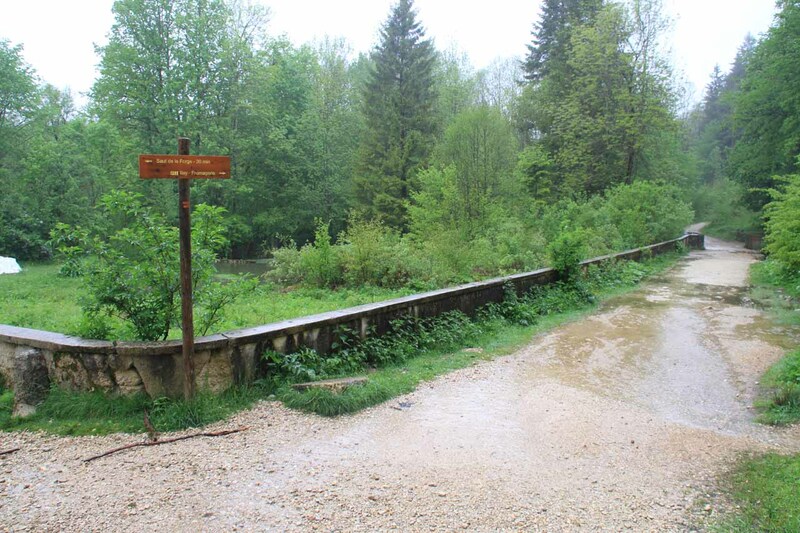 During our May 2012 visit, parts of the trail were flooded due to the Herisson River being in a swollen state from two days of persistent and heavy rains. 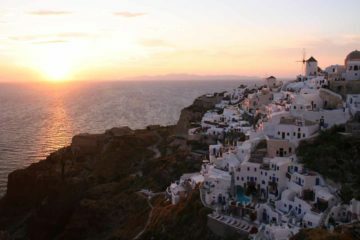 Therefore, we weren’t able to do the entire hike as we had planned from the bottom to the top and back down. Starting from the main car park (i.e. 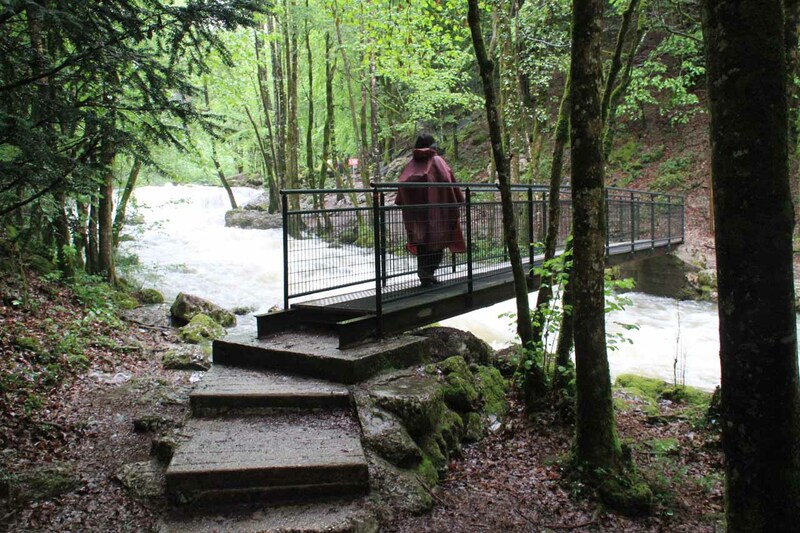 the one within Herisson Valley nearest to both Herisson camping as well as La Maison des Cascades), we followed a wide path leading to La Maison des Cascades Visitor Center. 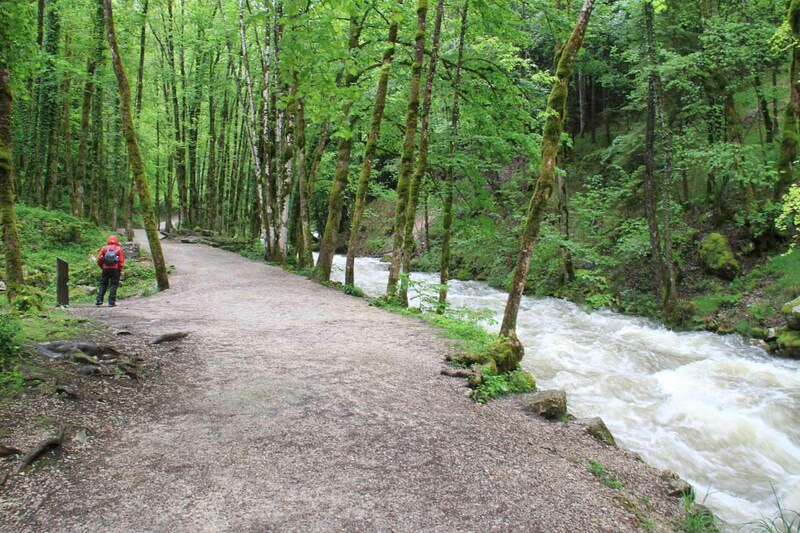 Immediately after the visitor center, the path flanked the Herisson River. Within a few minutes past the House of the Waterfalls, we saw the first waterfall right across the river called Tuffiere (or Tuffière). This one came from a side stream so it had more of a lacy appearance, which contrasted with the turbulence of the swollen Herisson River. 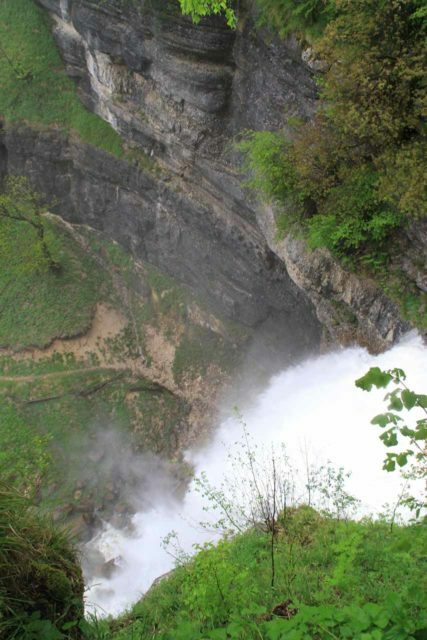 Barely another minute or two beyond Tuffiere was the first major waterfall on the river itself – L’Eventail. The word was French for “the fan,” and we speculated that it was probably so named because someone imagined it looked like a fan under certain conditions. 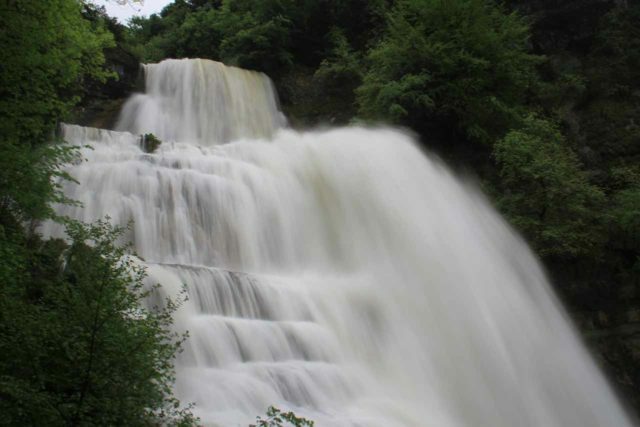 This powerful multi-staged waterfall was said to be 65m tall. 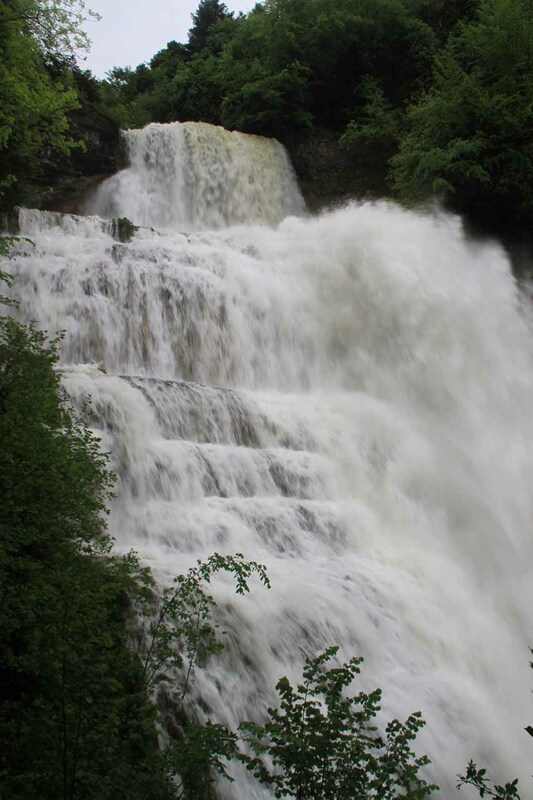 Just from our immediate impressions, we suspected that this was probably the largest of the Herisson Waterfalls. Next, we followed the most obvious path, which was to walk alongside the river then up the stairs right next to the waterfall leading to a few more switchbacks as the trail steeply climbed to access the top of L’Eventail. 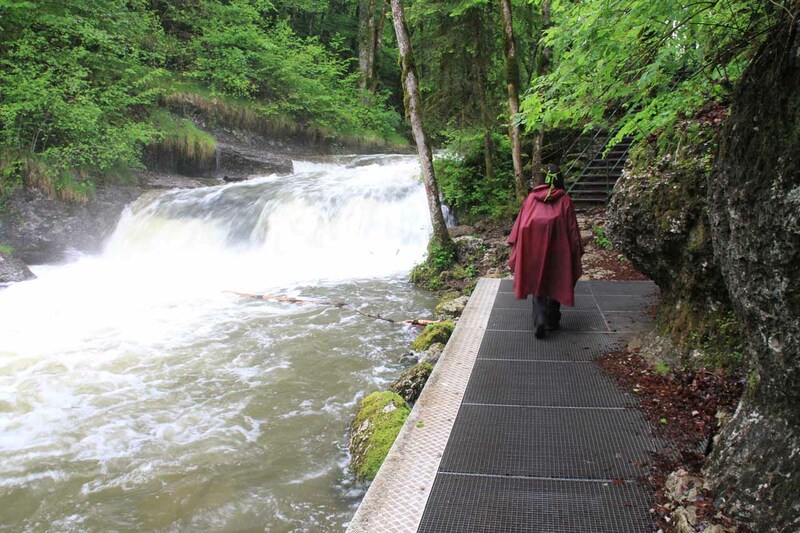 Since the trail so closely followed the river and waterfall, this meant that we were blasted by Eventail’s mist so we were glad to have brought rain ponchos and waterproof pants to shield ourselves and our belongings. However, we figured out later that there was another path that bypassed the misty section and rejoined the main trail up a couple of the switchbacks. I’m sure this would be the preferred way to go if getting blasted by L’Eventail’s mist was not desirable. At the top of Eventail, there was a railing and viewing area where we were able to get pretty close to the brink of the waterfall. However, since the river was swollen, some of it overflowed and prevented us from getting all the way to the corner of the railings where we would be as close to the brink of the falls as safely possible under normal circumstances. Next, the trail crossed the river over a bridge. Immediately after the bridge, there was a trail junction where one way went upstream while the other way went downstream. The downstream route led to an alternate top-down and angled view of Eventail as well as another perspective of the valley. Continuing along the main trail in the upstream direction for a few paces, we reached yet another junction. 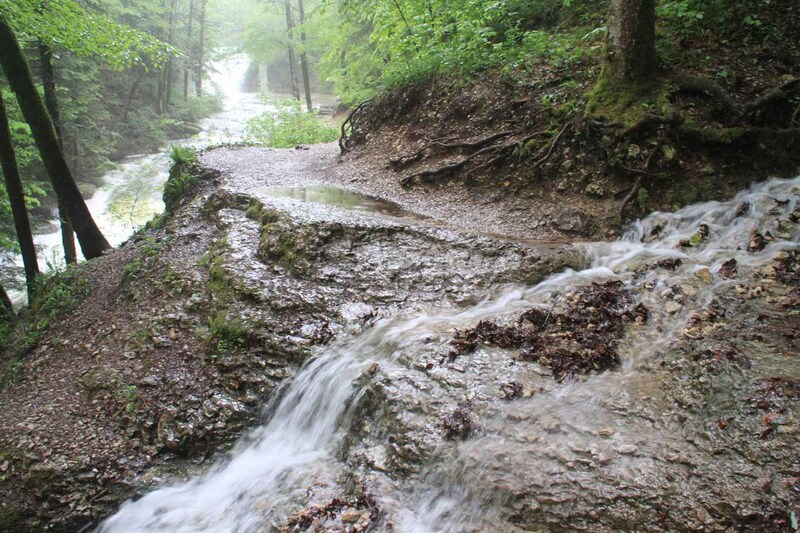 This time, there was a path that continued following the river as well as another path that ascended away from the river. 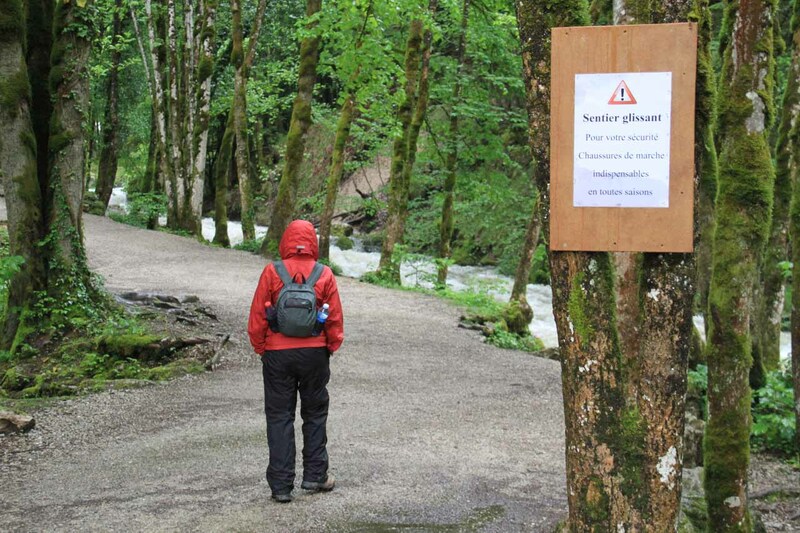 The riverside path, which was one end of a looped detour to get close to the front of the next major waterfall called the Grand Saut (“big leap”), was blocked because there was a persistent danger of rock falls. So the only sanctioned way to proceed was to take the ascending path. At this junction, we opted to obey the signs and ascend (despite us noticing an obviously defiant shortcut trail descending from the sanctioned trail and bypassing that barricade below us). The higher we went on the sanctioned trail, the more it became painfully apparent that there wouldn’t be any satisfying frontal views of Grand Saut. We’d eventually reach another trail junction where we saw another barricade blocking the other end of the Grand Saut loop. It was from this barricade that we could get partial views of the 60m Grand Saut, but even from here trees and cliffs blocked the view enough to tease us into trying to see more. 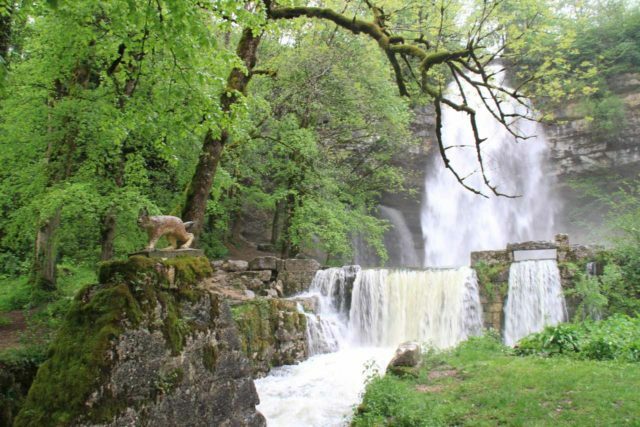 And knowing that the views wouldn’t improve, we actually committed our own act of tempting fate (knowing there were risks involved) to briefly go out to get that elusive view of the waterfall. 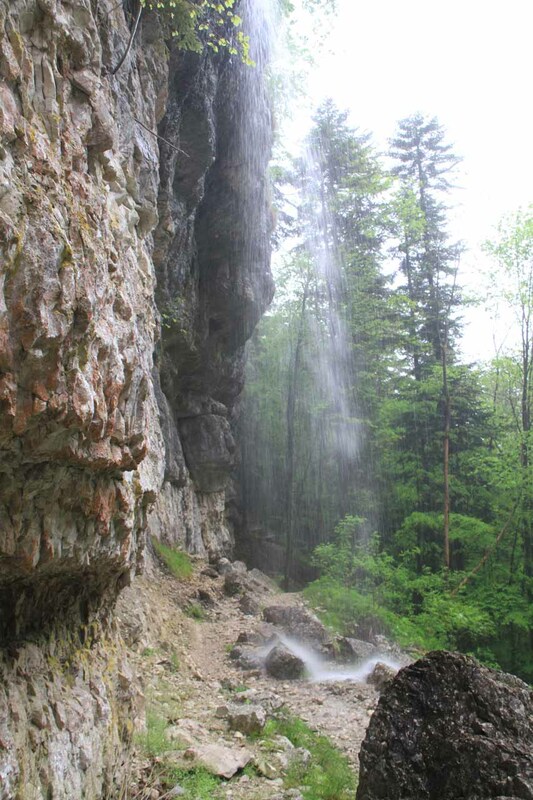 Given the rainy conditions, there were several small mini-waterfalls spilling from the overhanging cliffs above us right onto the trail. It was apparent from examining the cliffs surrounding this forbidden trail, that the authorities closed this trail for good reason. However, I sometimes wondered where the line was drawn between being overly conservative and being reckless since Nature itself harbored inherent risks and constant changes. In any case, we took whatever photos we could without even entertaining the option of going behind the waterfall (where the loop trail continued) before we returned to the main trail. I’m sure our act of defiance wouldn’t even be possible outside of our visit (which was apparently either the low or shoulder season) because we were the only ones on the trail at the time. 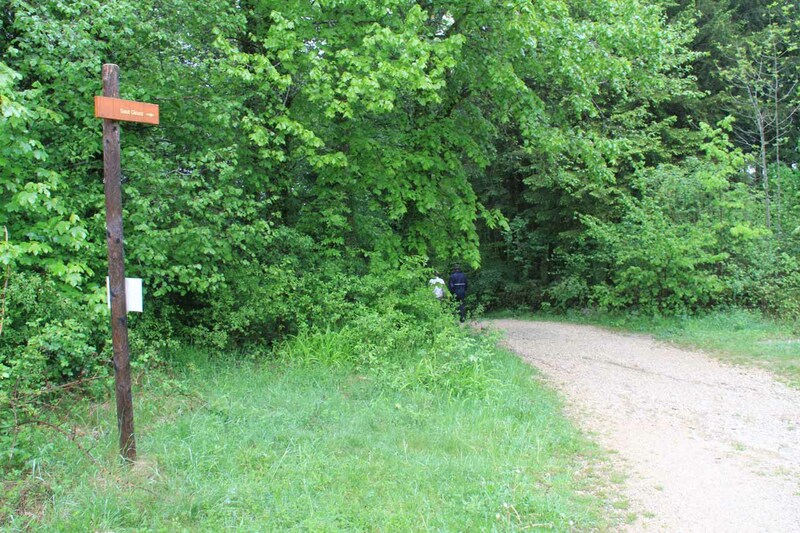 However, I’d bet with more people and perhaps more enforcement in the high season, this Grand Saut loop trail would be strictly interdit or forbidden. Anyways, the main trail continued ascending higher up the cliffs going past a few more mini-cascades crossing the trail. 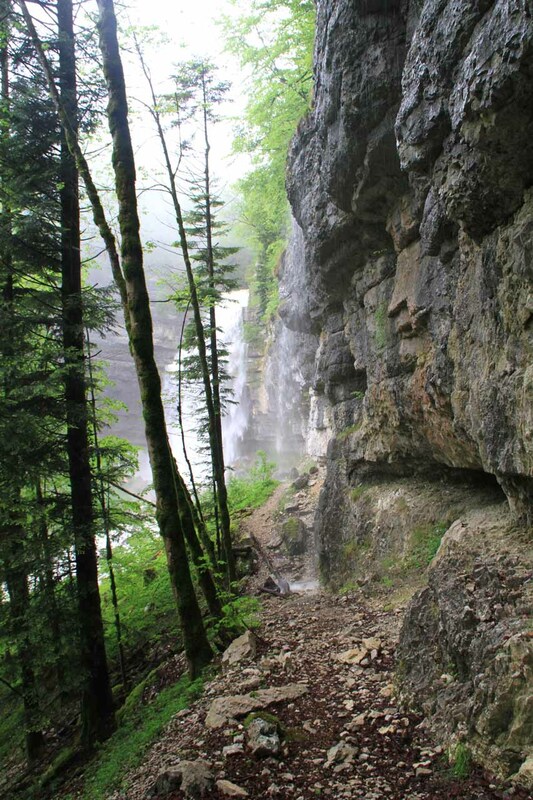 Eventually, the climb would flatten out somewhat until it reached a pair of overlooks above the brink of Grand Saut. It turned out that these would be the only sanctioned views of the big waterfall, but as was usual for most waterfalls when viewed from the top, it was not as good as the views from the front of the waterfall. 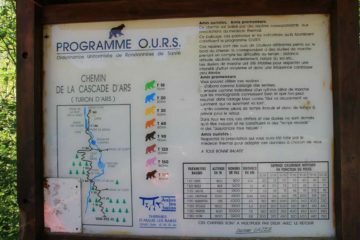 As the main trail continued further upstream from the waterfall, we saw another small waterfall on the river called Gour Bleu. 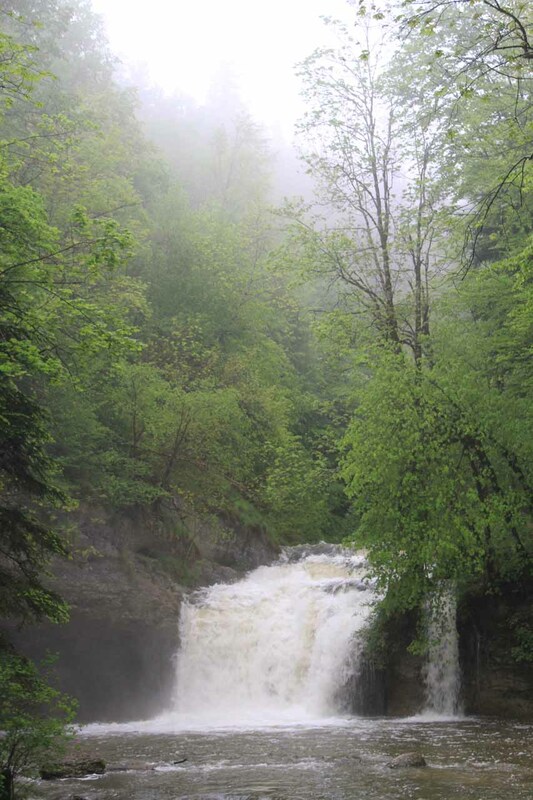 This one was gushing thanks to the swollen Herisson River, but wasn’t tall (probably a 5m or so drop). 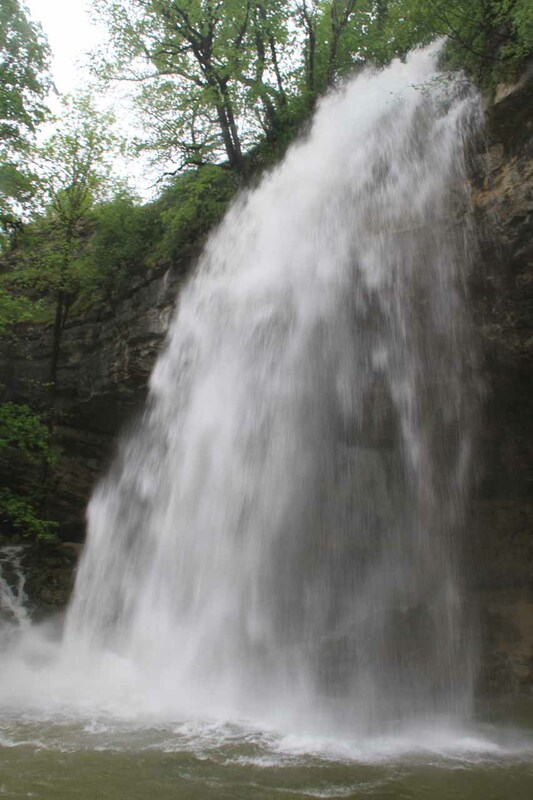 Above that waterfall, the Chateau Garnier Waterfall was only 5 minutes away. 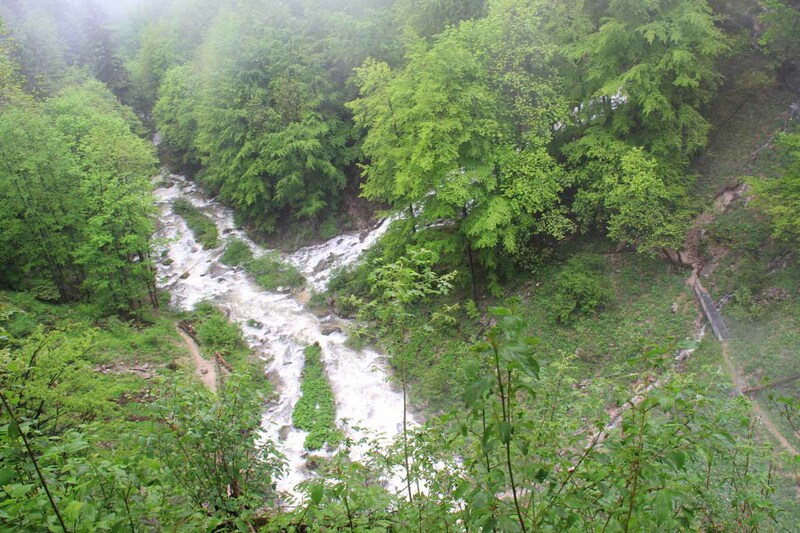 However, that was when we encountered severe enough trail flooding that we turned back. It was the type of flooding where lost footing could easily result in getting swept up by the strong current of the swollen Herisson River. 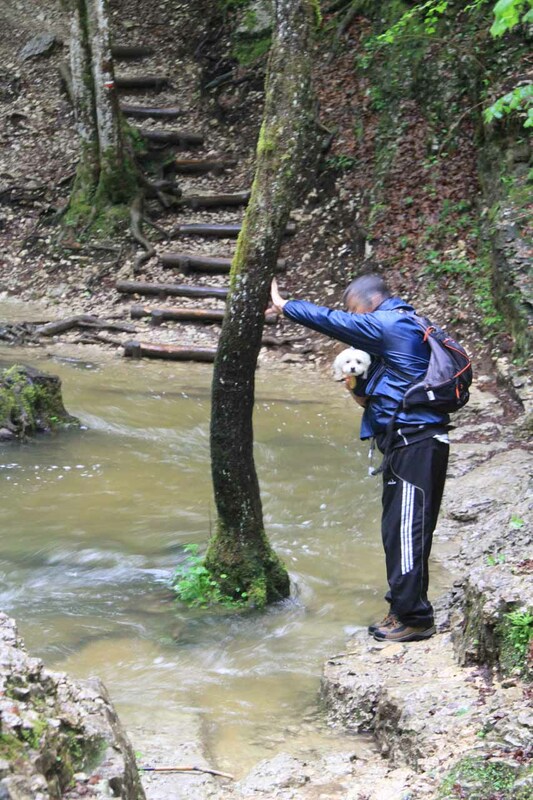 There was even a guy who seriously tried to figure out a way through the flooded section while carrying his dog. Eventually, we’d be back at the main car park about two hours after we had started. We’d ultimately drive back up and out of the Herisson Valley until we reached the car park yielding the shortest hiking distance for Saut Girard. There was a second car park close to Saut Girard by La Fromagerie, which had a slightly longer trail to the falls, which was why we chose not to take it. See directions below for the route we took to the car park that we selected. 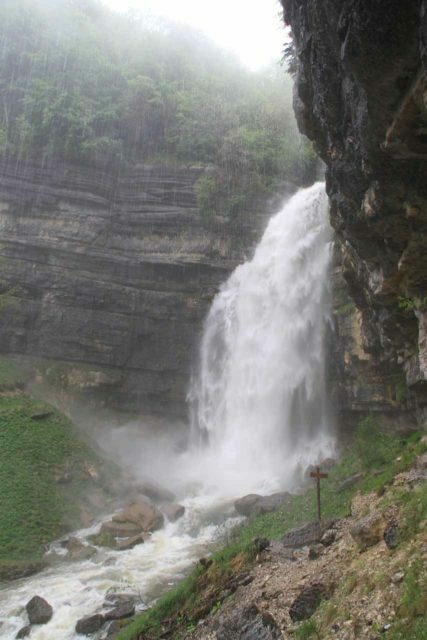 From the car park nearest to Saut Girard, it was only a 5-minute slightly downhill walk to get right in front of the 35m waterfall. 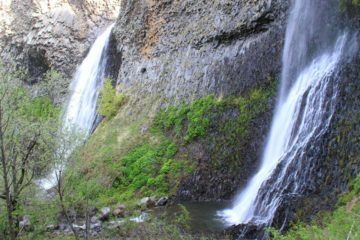 This waterfall featured a main plunge with a dam-like contraption fronting its plunge pool creating another small waterfall tier. There was also some kind of cat-like statue atop a pedestal just in front of that dam. I wasn’t sure what the significance of that statue was. In the alcove behind the main drop of the waterfall, there were additional cascades emerging from the alcove walls. 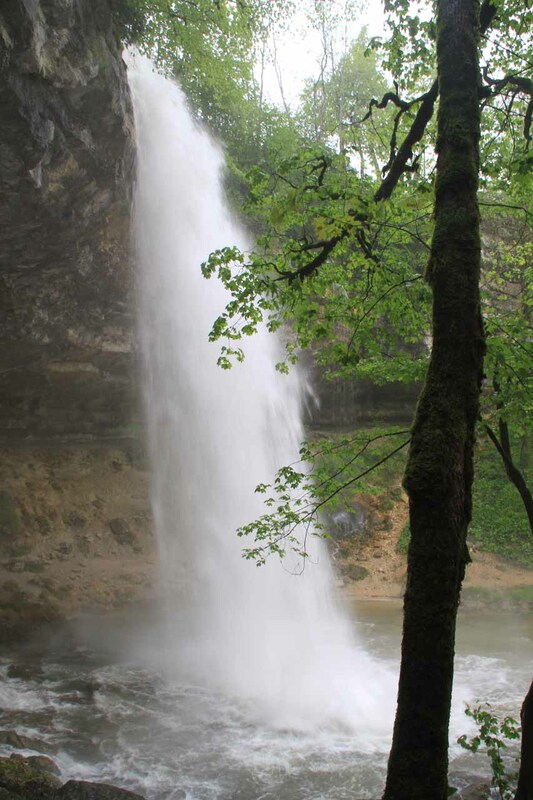 It was pretty apparent to me that they were springs, and that combination of a plunging waterfall backed by percolating springs was what made Saut Girard memorable. 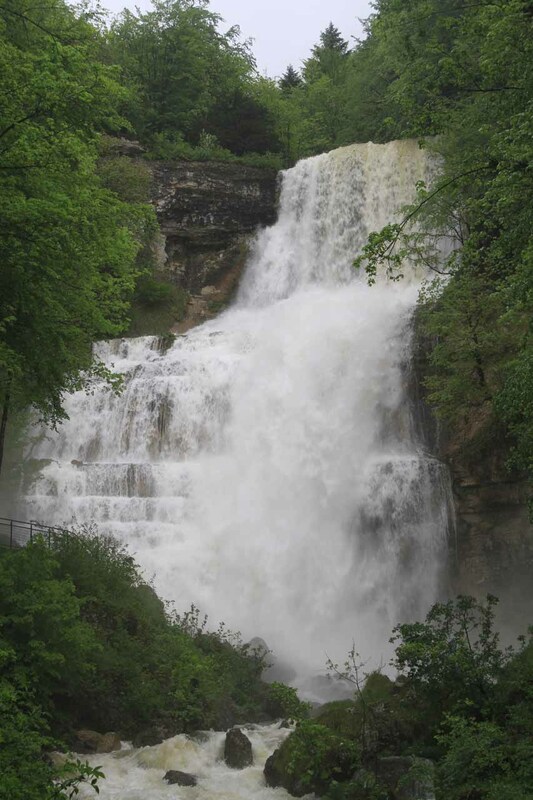 It wasn’t easy to get a clean frontal photo of the falls due to the heavy mist spraying out from its base as well as the positioning of some trees blocking some of the line-of-sight as well. Even from the bridge just downstream from the falls, some of the spray reached it while many trees grew alongside the river to prevent me from having a clean look from there. 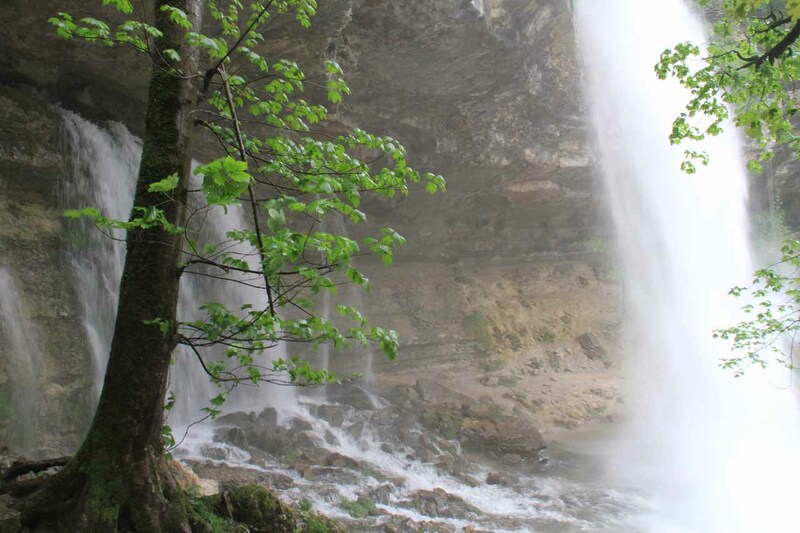 Almost besides the bridge, there was a trail junction where I could’ve continued walking downhill for 30 minutes to eventually reach another waterfall called Le Saut de La Forge while passing by yet another waterfall called Le Moulin Jeunet en route. 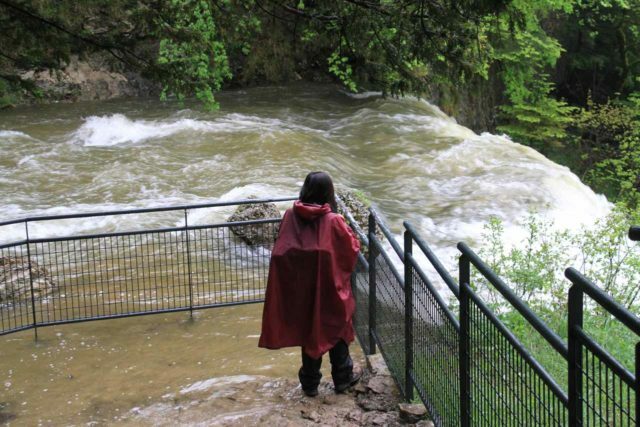 Ultimately, I could’ve reached the waterfall I skipped earlier this morning due to flooding called Le Chateau Garnier, which was a little further than Saut de La Forge. 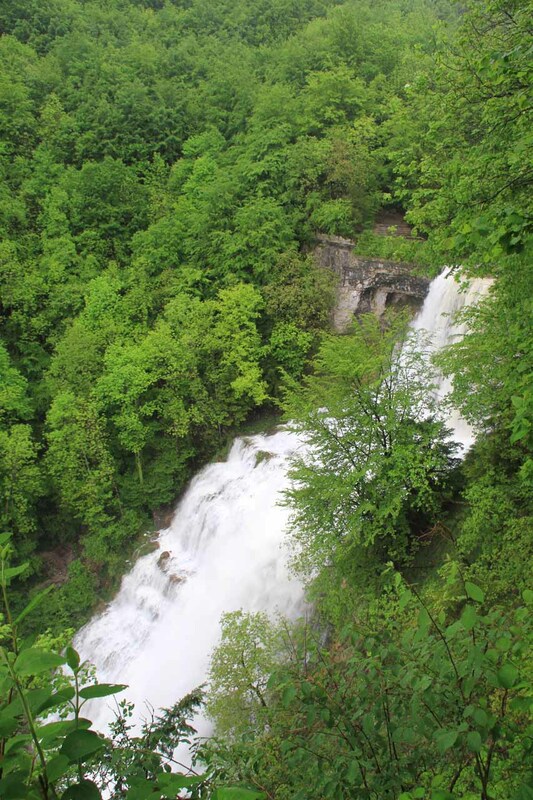 Unfortunately, I opted not to do it so I can’t really say anything more about these waterfalls. We drove to the car park for the Maison des Cascades from the town of Prévessin-Moëns, which is on the outskirts of Geneva near the Geneva Airport. We essentially followed the D984C due north to the town of Gex. Then, we drove the D1005, which ascended right into the Jura Mountains to the border town of La Cure. 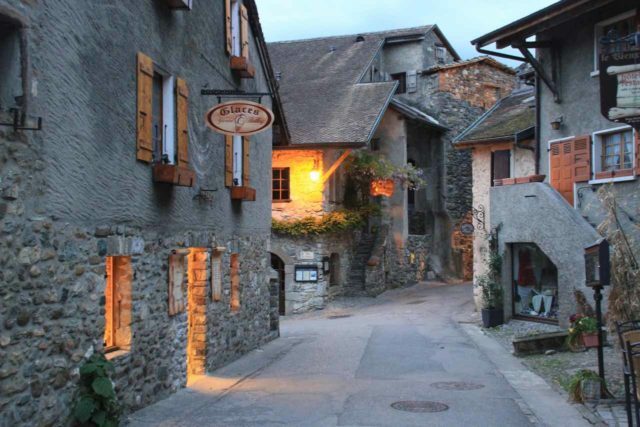 After La Cure, we then took the N5 and followed it until we took the D678 at Saint-Laurent-en-Grandvaux. 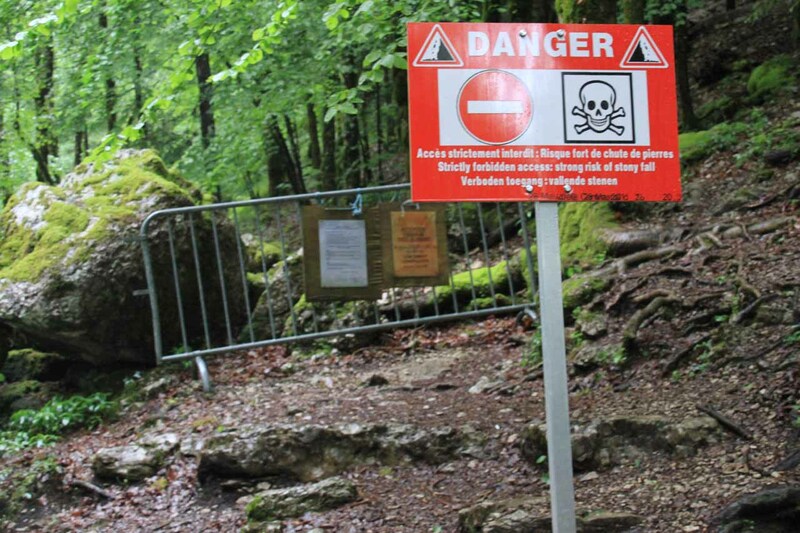 By this point, we started to see signs for Cascades du Herisson, and the signs had us follow the D39. The D39 eventually junctioned with the D326 where we took that road down into the valley past Lac de Chambly and Lac du Val and eventually to the desired car park. The drive from Prévessin-Moëns took us about 2 hours. 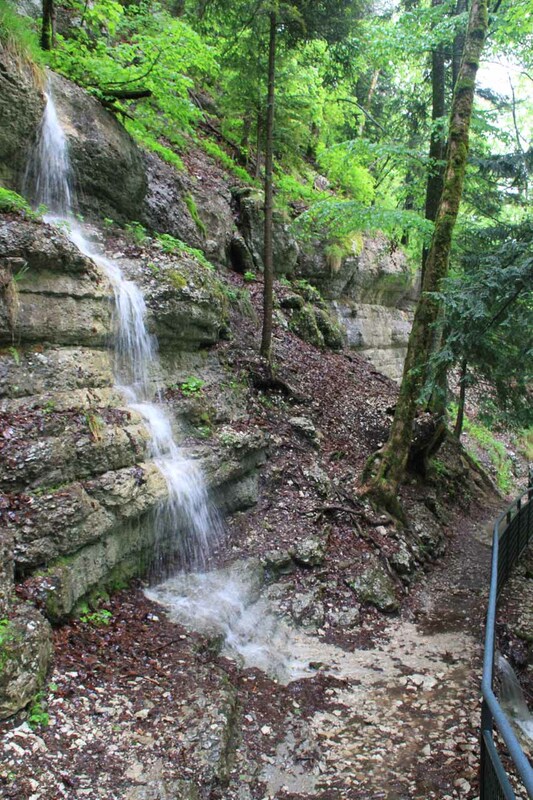 Also note that while driving the D39, we encountered a few car parks for the Herisson Waterfalls. 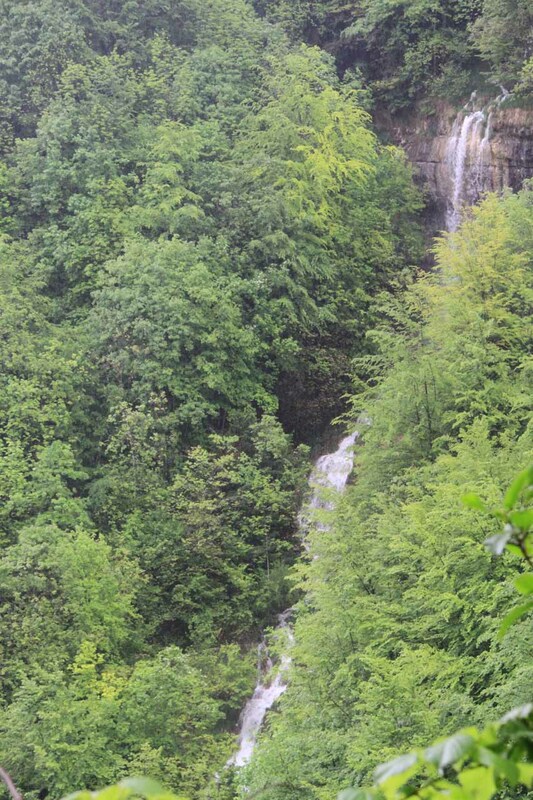 These car parks were some of the alternate entry points descending towards the waterfalls series. Among the ones we passed by were at Ilay (for Grand Saut), La Fromagerie (also for Grand Saut), Le Saut de La Forge, and L’Eventail. 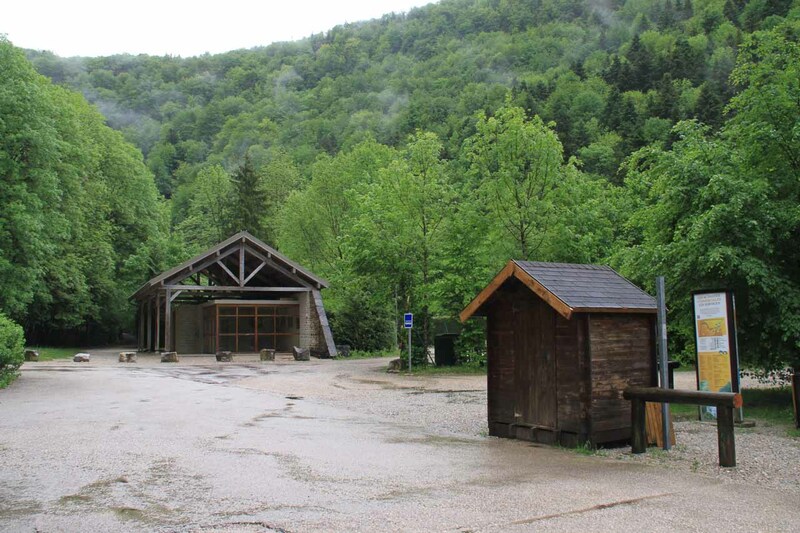 When we went to the car park for Saut Girard, it took us about 30 minutes from the Maison des Cascades car park going back the way we came until we turned right onto D75. The car park was only a minute or two past the D39/D75 junction. 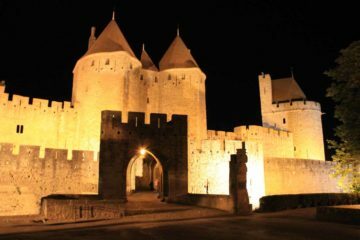 For context, the town of Prévessin-Moëns was 11km northwest of Geneva and 142km (2 hours drive) northeast of Lyon. The city of Lyon was 466km or at least 4.5 hours by car from Paris. However, we used the very fast and efficient TGV (high speed train or le train a grande vitesse), which wound up taking around 3 hours to cover this stretch between the two major cities.